as to get ready when the time expires. Do you know anything about our Great Grandparents. They had but 3 brothers Christopher William and John. I could talk better than write they have it pretty straite now but I don’t know how it will turn out but to establish you heirship and get a chart of the Emmrick family you send to Attorney Tompson Centerville Iowa and $2.00 they he will send it the estate is valued at $35,000.00 but was not to be divided until 99 year after his death. come and see us. I had thought I would come out next Sunday and could talk better but I don’t know as I am not as well as I used to be and I cannot tell so thought I had better write. Now let me hear from you folks. 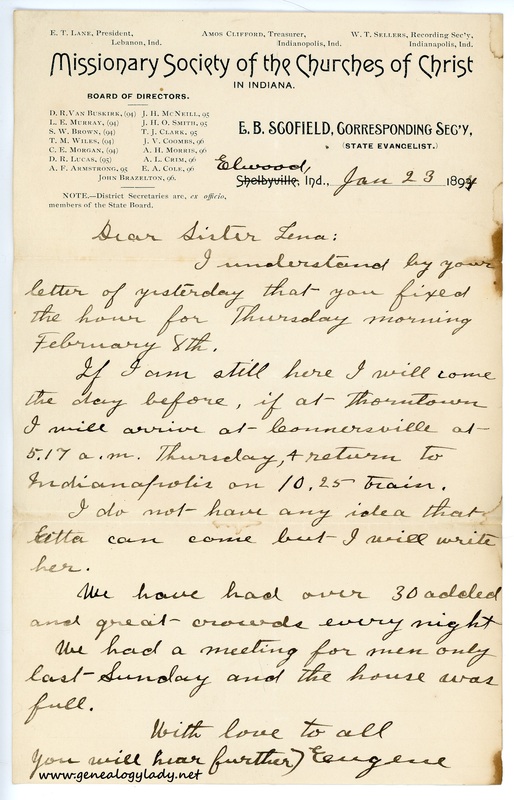 This entry was posted in Fayette Friday, Genealogy and tagged 1904, Connersville, Daniel Kerschner, Emerick Estate, Fannie (Eminger) Schenck, genealogy, Hamilton, Indiana, Ohio on March 16, 2018 by Deborah Sweeney. I understand by your letter of yesterday that you fixed the hour for Thursday morning February 8th. If I am still here I will come the day before, if at Thorntown I will arrive at Connersville at 5.17 a.m. Thursday, & return to Indianapolis on 10.25 train. I do not have any idea that Etta can come but I will write her. We have had over 30 added and great crowds every night. We had a meeting for men only last Sunday and the house was full. 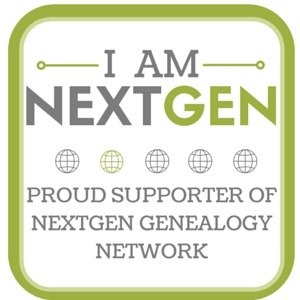 This entry was posted in Fayette Friday, Genealogy and tagged Cecelia (Scofield) Updegraff Hargrove, Connersville, Daniel Kerschner, Ella (Scofield) Kerschner, Etta (West) Scofield, Eugene B. Scofield, Fayette County, genealogy, Indiana, John Wesley Hackleman on March 9, 2018 by Deborah Sweeney. Yours of the 24th, just received, but as I was at Indianapolis yesterday it may have come sooner. I have not been feeling at all well for more than a month, I first had a severe cold for two weeks or more & then had trouble with my stomach. I can hardly say what is the matter, I took considerable unwholesome “dosing” to cure my cold, such as pepper-vinegar stews, lemons, & at the same time drinking too much coffee, & in this way, no doubt, got my stomach disordered. I have had no fever at any time, yet I feel almost past going most of the time. I was a good deal better the latter part of last week, & until yesterday afternoon, but feel indisposed again to-day. Having lost so much time from my elocution, I tried a lesson Monday & one Tuesday. Met Celia at Uncles, she said that Ella & the twins were at her house Sunday. Reported the babies as growing so fast & as looking so sweet in their short clothes. I should like so much to see them. She said that Dan is looking well also. We are very well pleased at Noblesville, my time will not expire until the close of the year. We have a crowded house every Sunday night. Our work goes on satisfactorally & I do not expect it to let up in the least. Kiss the little ones for me & tell them that I should be glad indeed to see all. Love to Ella, Bal, & my best regards to Dan. & his Mother & Maria. With much love, I am your brother Eugene. 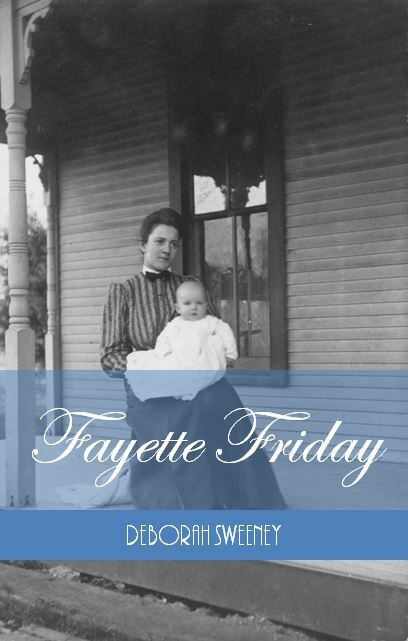 This entry was posted in Fayette Friday, Genealogy and tagged 1891, Balzora Scofield, Bertha (Kerschner) Archey Beck, Beulah (Kerschner) Hubbell, Cecelia (Scofield) Updegraff Hargrove, Connersville, Daniel Kerschner, Ella (Scofield) Kerschner, Eugene B. Scofield, Fayette County, genealogy, Indiana, Lena (Scofield) Hackleman, Silvester Scofield on March 2, 2018 by Deborah Sweeney. 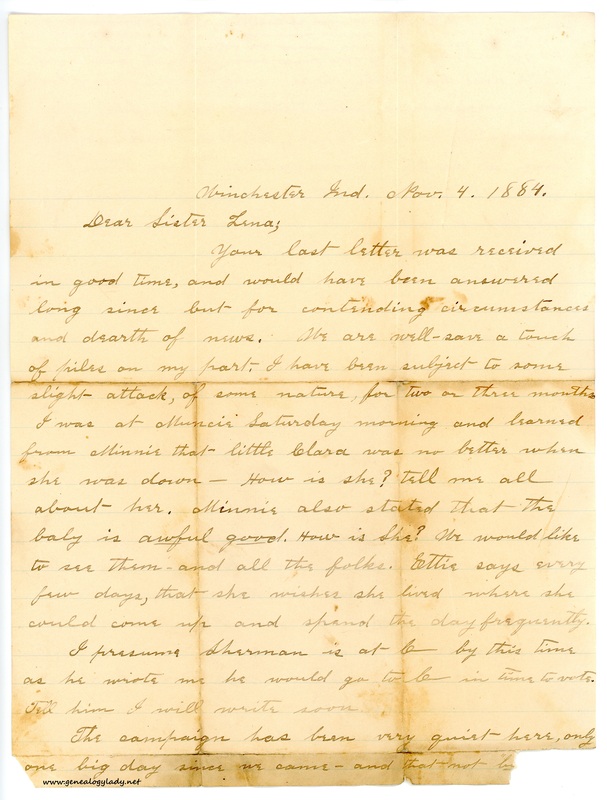 Dear Sister; I have been owing you a letter for some time and will improve the present opportunity. As you will see I am way out here in south western Kansas, am here to preach and am getting along finely, last evening the new Church was full to overflowing and quite an interest is being manifested. Two have been added since we began—a week ago yesterday. I left home Wednesday morning Sept. 22 at 6 a.m. and was met at the Depot at Bloomington by Minnie, and as the cars were very much crowded I thought best to accept the invitation to remain over night. Thad. has suffered very much for several months with a sore eye. He had his eye ball cut some six months ago. He had gone to work for the first time in months the week I saw him. His children (Lee Roy Excepted) are all doing well. Arther is a model of a young man, and Minnie is a real lady. No one could change more than has El [Eldora]. [page 2] I enjoyed very much. On Thursday morning I resumed my journey arriving in Kansas City too late for the train west and put up at a hotel for the night. At 10 a.m. I took the train and crossed the State of Kan. by daylight arriving at Dodge City several hours late at 2 a.m. and went to bed. At 8 a.m. I again took up my moving tent and for 9 hours wended my way over the great Buffalo plains of the Southwest arriving at my destination at 6 p.m. Saturday. Thus you see I made my journey of 1,000 miles mostly by daylight. I had traveled most of the road from New Castle to Bloomington along which there are very few objects of interest, save Wabash River which is lovely this season of the year. On my journey crossed the Wabash, the Illinois, the Mosouri and the Kansas and Arkansas all about the same size. at 2:30 p.m. the 24th I crossed the Great Mississippi River at Louisianna Mo. It is as clear as White Water, and greatly in contrast to the muddy Mo. River. [page 3] look very fine. The cattle in all parts of the country are looking well as are the horses and sheep, hogs are a scarce article. This is one of the finest counties in the State. One year and a half ago there was not a house where the Co. seat now is, now there are 800 or 900 people. A quarter section bought of the U.S. two years ago just north of the present town for $200 is now worth $12,000 and quarters all over the County are ranging from $800 to $3,000 and $800 piece is generally much broken but good pasture land. Keep it in the family—I bought a half section of as fine land as there is in Kan. last Saturday. It is 12 miles out, but that will not affect in 10 years from now, and does not affect it much now. By the help of my friends here I got it at a big bargain from parties auctions to sell, and have just been offered $500 for my bargain—but no. It lies to the south west of here. See map. Please say little about it. [page 4] and few miles west of here the wild-horse. Well I guess I have told all of interest save it should be about domestic matters. The houses here are all small. In the country most of them are made of sod, and when plastered outside and in are very cozy—but not many are thus finished. The most of the people are industrious and honest. They leave doors unlocked, and are seldom troubled with thieves. They are chiefly from Indiana, Ill., Ohio and Mo. as named in proportion of numbers. Give my regards and these presents to Dan. My love to Ella and the Babies and also to Bal. & all. 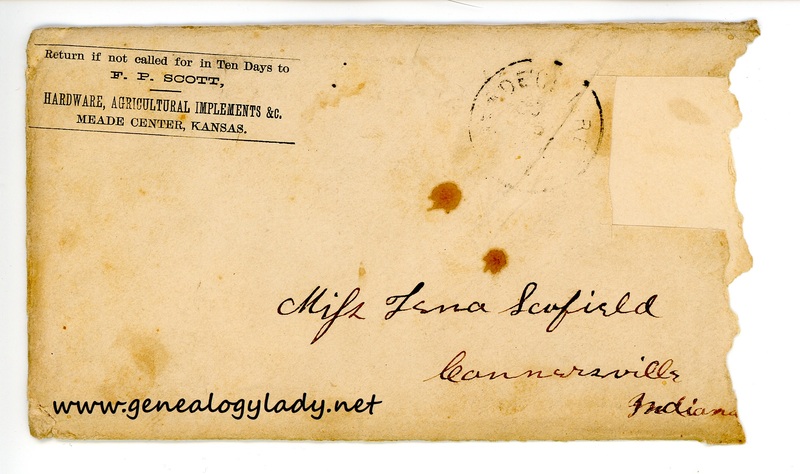 This entry was posted in Fayette Friday, Genealogy and tagged 1886, Arthur Scofield, Balzora Scofield, Connersville, Daniel Kerschner, Ella (Scofield) Kerschner, Eudora R. (Scofield) Condon, Eugene B. Scofield, Fayette County, genealogy, Indiana, Kansas, Lena (Scofield) Hackleman, Leroy W. Scofield, letters, Meade County, Minnie (Scofield) Church, Thaddeus S. Scofield on February 2, 2018 by Deborah Sweeney. Your last letter was received in good time, and would have been answered long since but for contending circumstances and dearth of news. We are well—save a touch of piles on my part. I have been subject to some slight attack, of some nature, for two or three months. I was at Muncie Saturday morning and learned from Minnie that little Clara was no better when she was down—How is she? Tell me all about her. Minnie also stated that the baby is awful good. How is She? We would like to see them—and all the folks. Ettie says every few days, that she wishes she lived where she could come up and spend the day frequently. I presume Sherman is at C— by this time as he wrote me he would go to C— in time to vote. Tell him I will write soon. [page 2] We like the people here very much—everybody nice, wide-awake, up-to-the-times sort of folk. Our membership is not large, but I think we will have a large congregation here some time. The 24th of this month I am going to Dunrith, Henry Co. to hold a two weeks meeting, I conducted a successful meeting there last year. We expect Bal. to visit us soon. Would be glad to have you come sometime, whenever you can. Was sorry to learn (from Minnie) that you are having chills again—trust you will soon get rid of them. Dr. Spurgeon has a prescription that he says will never fail to break the chills. I think I could procure if for you if you want to try it. It will do its work in 48 hours at the most. We had a fire near here last night, tile mill. This is election day and I have had my say. We are having a typical November day—Damp—Sunny—then cold & windy, just like the “old days” when we hauled in our fodder or corn crop. Dinner is near ready—I am tired writing and must close. Ettie sends love. Give our love Ella—Dan and all. How sad was the sudden death of Cousin Alice—So many die this year—we know not who will be the next. We should remember the Savior’s words, “Be ye ready.” We should ever be prepared for our time may be near at hand. E.B.S. 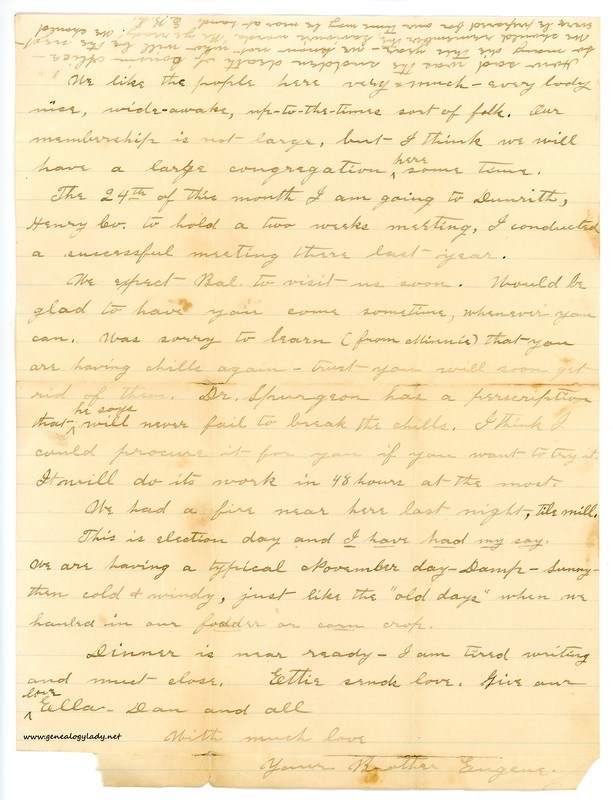 This entry was posted in Fayette Friday, Genealogy and tagged 1884, Alice (Scofield) Pierson, Balzora Scofield, Clara Kerschner, Connersville, Daniel Kerschner, Ella (Scofield) Kerschner, Etta (West) Scofield, Eugene B. Scofield, Fayette County, genealogy, Indiana, Malinda "Minnie" (Scofield) Claypool, Sherman Scofield, Winchester on December 29, 2017 by Deborah Sweeney. As it has been some time since I have written it would seem like I should have much to say, yet I scarcely know where to begin. Yesterday I returned from Hillsboro through a good old fashioned snow storm. May and Ettie had returned from their Aunt’s, and on my return were at home. May’s school will be out in about three weeks. She seems to be having a good time here. [page 2] also one into kitche, door out of kitchen into woodhouse. We have every thing in order and once more feel at home. We are but 4 squares from Minnie’s, 5 from the Church, 5 from the Post-Office and 3 from the Depot. We live just in the rear of the School house. I could not be better pleased than in Muncie. The Church here is getting along well. We have as good attendance as the average audience at home when Bro. Robertson was there. Our S-School on the average is about 100. We have teachers meeting each Tuesday eve. As far as society is concerned we have had but little since we have been here. [page 3] best at the Teachers meeting tonight to have it postponed. [page 4] weather for this season of the year but I hope it will soon be Summer. Dr. Jackson and Jessie Lee were married last Wednesday night. Chrushed strawberry and broadcloth. Dr. S— seems to be going quietly along. Never says anything or does anything worthy of remark. I have no news in particular I wish you here awhile this time of year. Ettie says you would have had a great deal better time if you had have come in warm weather. I hope that the next time you visit us it will be when we can entertain you better. 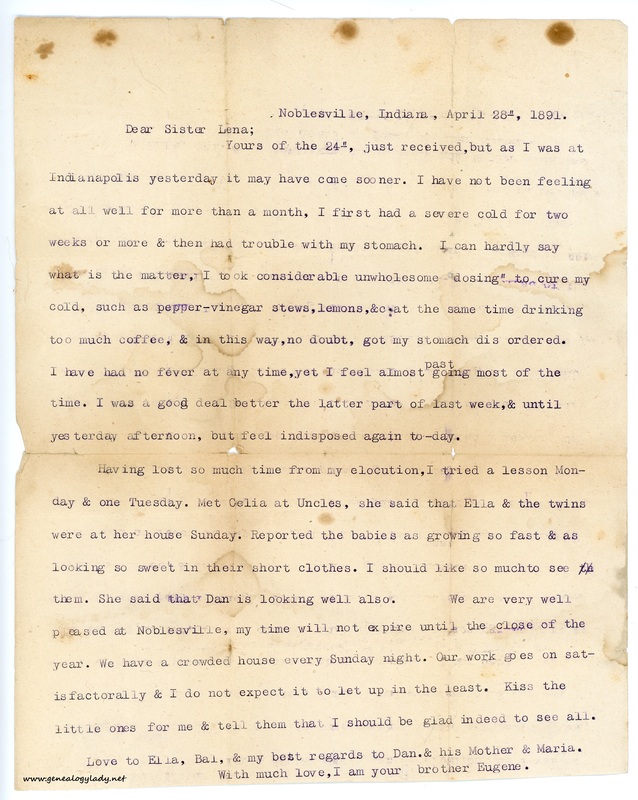 This entry was posted in Fayette Friday, Genealogy and tagged 1883, Connersville, Daniel Kerschner, Ella (Scofield) Kerschner, Etta (West) Scofield, Eugene B. Scofield, Fayette County, genealogy, Lena (Scofield) Hackleman, Malinda "Minnie" (Scofield) Claypool, Muncie on November 10, 2017 by Deborah Sweeney. This postcard was written by Beulah Kerschner. She was Bertha Kerschner‘s twin sister. Due to the child-like nature of the handwriting, I would assume that the card was written between 1900 and 1910. It was definitely before 1916 as Beulah and Bertha’s Papa died that year. 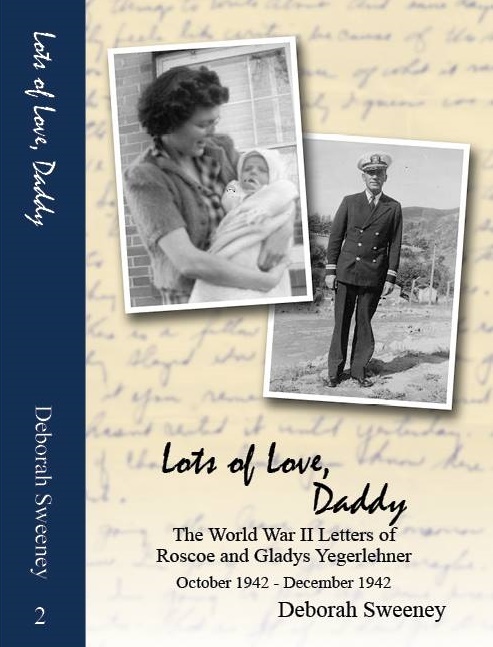 This entry was posted in Genealogy, Lena's Postcards and tagged Bertha (Kerschner) Archey Beck, Beulah (Kerschner) Hubbell, Daniel Kerschner, Ella (Scofield) Kerschner, genealogy, Indiana, Lena (Scofield) Hackleman on March 11, 2015 by Deborah Sweeney.